All roads led to the Ultimate Indie Weekend in Bonifacio Global City as Bonifacio Arts Foundation Inc.(BAFI) held simultaneous events in commemoration of the National Independence Day: the second BGC Arts Center Festival entitled BGC Loves Local and the first in the country Manila Mini Maker Faire at The Mind Museum. The events held on June 10 -11, 2017 celebrated the Philippines’ rich heritages and abundance of artistic freedom with various performances and exhibitions from Filipino artists, and showcase of local inventions and assembly of brilliant Filipino minds. The BGC Arts Center Festival’s theme “Revealing the beauty and reach of homegrown talent and creativity” focused on showcasing homegrown talents and expose their craft to the greater public. Held at the BGC Arts Center, the indoor and outdoor areas of the venue brimmed with pride and color of various art installations and mind-tickling shows.The festival was made possible by the support of NutriAsia. The two-day BGC Loves Local was filled with families and friends alike who reveled in the performances in plays and dances. 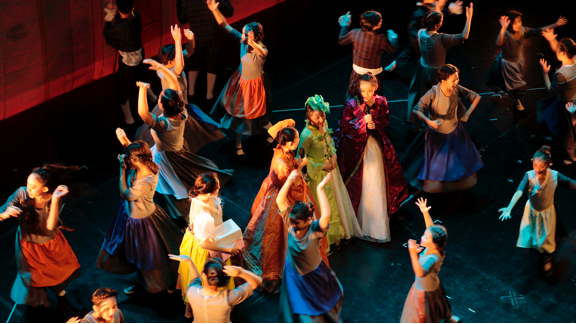 Cinderella by KidsAct opened the festival in the Globe Auditorium. The audiences of the much talked about local adaption of I am Asher Lev by Twin Bill Productions held their breaths in the one-hour show that depicted an artist’s struggle, still relevant today. The Philippine Opera Company also showcased Filipino music with their Harana. One-act shows were also seen at the Zobel De Ayala Recital Hall presented by various groups. Dulaang ELYU demonstrated Ilokano pride with NaamengAk Gamin. Improv groups SPIT and Third World Improv with Indi’sarswela and MapaglarongIsip at Salita, respectively, gave highly entertaining displays. Move Manila also proved that endless energy exists with its 7-hour street dance at the Sun Life Amphitheater. The gloomy weather didn’t dampen the lively and colorful vibe on the second day of the festival. It was equally filled with riveting performances that opened eyes to timeless conversations and themes.Passages by Jean Marc Cordero, #galingNAMCYA by the National Music Competitions for Young Artists were staged in the Globe Auditorium. Outdoor installations put the fest in the festival at the Alveo Central Plaza. Instagram-worthy installations of Daniel dela Cruz and more were present at the event.Eccentric features from Hayme Vincent’s PaIN$tAcüLaR and Entablado’s Lucid tickled the minds too. The festival culminated on a high note thanks to the mini music festival Independent by Stage Sessions. Artists like Gio Levy, Bullet Dumas, Curtismith, The Manila String Machine and Ateneo Blue Symphony, among others, capped off the Sunday night with a moving concert. Over 55 Makers from across the Philippines participated at the first Manila Mini Maker Faire with projects ranging from DIY drones and hover boards, bill to coin changer machines, Pinoy-made board game, 3D printers, make-your-own solar lamps to be donated to rural areas, and robotics. Families and hobbyists alike flocked to the fair held at The Mind Museum on June 10-11. The family-friendly fair showcased inventions from academic institutions such as Mindanao State University’s FAB LAB – a technical prototyping platform for invention and innovation, providing stimulus for local entrepreneurship. The group was supported by 3M Philippines in their goal to foster innovative students and their projects. The two-day event was abundant with various demos and educational workshops from companies and individuals such as Sparklab Innovation Center wherein they shared tips on starting a Maker Journey and the fusion of arts and sciences, ScienkidficXplorers who demonstrated interactive experiments and engaging activities like singing all the elements in the period table, and Marvel graphic artist Leinil Yu who shared his insights on the evolution of comic-book designing and character development. Kids and kids at heart were amazed at the various inventions in the different booths at the fair. MusikoImbento’s booth that showcased DIY musical instruments like a base guitar made out of metal spoons won the Best Maker Booth Award. Makerspace Manila, on the other hand, bagged the People’s Choice Award wherein fair goers raved about the electronic building blocks they featured. Drone lovers also had their competitive hat on during the micro done racing by Skyeye. Free workshops were also catered to the attendees. Fusion 360 conducted a 3D Design workshop. Arduino programming by Sparklab Innovation Center and Machibot robotics session by Machibox Inc. immersed the fair goers in what’s the latest in science and technology. Hi, all is going sound here and of course every one is sharing data, that's actually good, keep up writing.